You can't out-train your diet! You have all come to this nutrition program because you've seen the value in how changing your nutrition lifestyle can get you closer to achieving weight loss. It is also just as important to remember, as you move forward, that you cannot out-train your diet. By this, I mean that the mentality of “I can eat whatever I want because I'm working out really hard” is not going to help you. Working out hard is going to expend more calories, for sure. 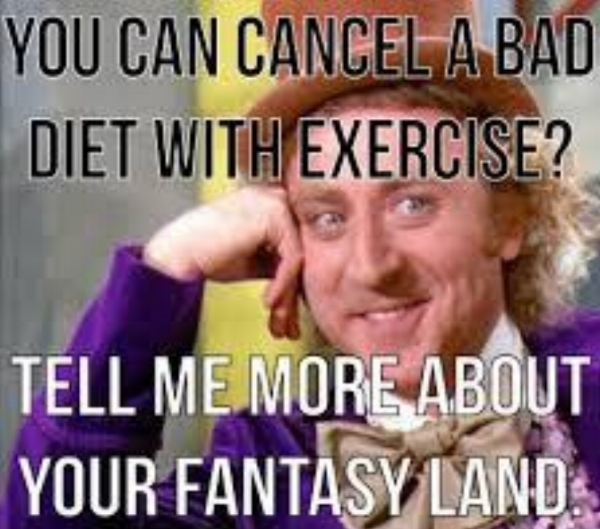 But we can train you at Spindle as hard as we can and, if you go and eat four cheeseburgers every day, it will likely not get you closer to weight loss. Today, consider your relationship between training and nutrition. Do you tend to eat healthier on days you exercise because you're feeling good? Or do you tend to eat things that are less desirable on days you exercise because you justify them with your exercise? It is important that you don't get too caught up in the relationship between food and exercise, as they can become unhealthy over time. But, it is important for you to note if you have this correlation and how it could potentially bring you further away from your goals.